On this morning or afternoon tour, explore some of the country’s most rugged scenery in Tonto National Forest. In a Hummer H1, you’ll experience desert terrain, mountain landscapes and towering trees in a pristine setting. Upgrade to the Extreme tour for an action-packed ride! There are plenty of thrills on this Hummer H1 guided tour through the Tonto National Forest. Your experienced and knowledgeable driver will take you through the forest’s diverse terrain in a vehicle that’s built to handle even the most craggy trails. Keep your eyes peeled or a variety of wildlife, as your driver points out Four Peaks Mountain, named for the distinctive four peaks on the North-South ridge. 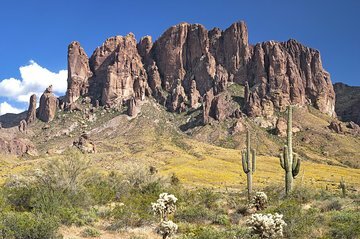 Further afield are Superstition Mountains, where the legendary 'Lost Dutchman's Gold Mine' may or may not exist. For adrenaline junkies: If you want an even more exciting adventure, where you’ll navigate through more rugged terrain, upgrade to the extreme tour.